Every business will be sold. The only question is will the business owner be alive to enjoy the fruits of the years of labor. Business succession is the most important decision you can make. If you elect to do this carelessly, your chance of doing it correctly is slim. My very first speech at a National Funeral Directors Association convention was titled, “Do You Need to Sell Your Home in Order to Get Your House in Order?” The question posed addressed whether or not you will have enough money when you want to retire and what role your business will play in that life event. In my 40 years of working with business owners, predominantly funeral and cemetery businesses, I have perfected a system that works. It is an integrated approach. You can try to do it yourself or find advisers to fill in the key points. However, guessing doesn’t work. Estimate the amount of money you need to be financially independent. Estimate the amount of the assets you have to fulfill your income needs. Determine the best method to secure your Social Security and other government benefits. Can you retire now or in the near future? How should your business sale take place to make retirement a reality? Who are the best buyers to make retirement a reality? Allow me to take you through each of these integrated steps. Step 1: Estimate the amount of money you need to be financially independent. You hire an accountant to do a tax return for you. Imagine they tell you, “I am going to arrive at the wrong number, using flawed assumptions every step of the way – and you are going to like the outcome!” Isn’t that a bit suspicious? Of course it is. I am about to do the same thing. How much money you need, year in and year out, is your “buying power” number. Assume this is $100,000 per year. Chart 1 is the buying power of $100,000 per year for 15 years. If you expect to live for 15 years, you need $1.5 million to provide this buying power assuming 0 percent interest, a 0 percent inflation rate and a 0 percent tax rate. However, if the money is invested at 5 percent interest, you now need less – or about $1,040,000. That is $460,000 less due to the interest earned on the investment each year during the time period you assume to be your remaining lifetime. In addition, you must be responsive to changes in investment returns. I have been doing this more than four decades and have seen interest rates at 15 percent and at 0 percent during that time. Pick an interest rate that you think can be met each year. If you are going to make a flawed assumption, pick a lower interest rate. No one ever plans to fail, most just fail to plan. Remember I said this is going to be a flawed calculation. A common mistake is determining your time line. The flaw occurs when you assume you are going to live 15 years and in fact live 20 years. Well this extra five years of life needs more income. 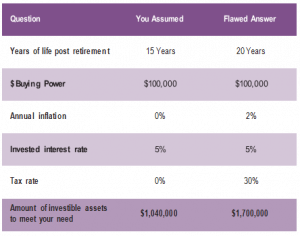 If you expect to live 20 years, you need $1.25 million assuming a 5 percent interest rate. Another common mistake is to ignore inflation. In Chart 2 the green line is your intended buying power of $100,000/year. The problem is, inflation occurs and reduces your buying power (red line). The blue line demonstrates the increased income you would need assuming a nominal 2 percent inflation rate. Assuming 5 percent annual interest earnings and then factoring an inflation rate of 2 percent, the amount needed increases from $1.25 million to about $1.47 million. This increases your need again. The computation may be flawed but under your control. If you expect to live 15 years from retirement, assume 20. If you expect to have a flat buying power, assume an inflation rate. The worst that happens is that you leave more money for your kids. Tax rates are a concern as well. We live in a “net” society. You don’t get to spend all that is earned. You get to spend the net after-tax earnings. $100,000 with 2 percent inflation will need to be funded with about $1.7 million. You can see that increasing the variables increases the amount of money needed to provide for your retirement. 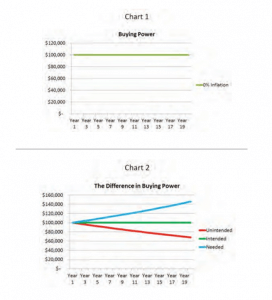 Determining your buying power is not a guess. Don’t pick a pie in the sky number, nor assume you can budget yourself once in retirement. You are living – not waiting to die. Look at your charge cards, checkbook and other records of spending. Make an educated guess. Remember, if you are going to be wrong, pick a number higher than your need. Also, this is after-tax dollars, so the amount of your income and the amount of your spending are two different numbers; the difference between the two is taxes. Your questions should be answered with the estimated assumption and then the larger flawed amount. Assuming 15 years of life after retirement, with a $100,000 buying power, 0 percent inflation, 5 percent earnings and 0 percent taxes created a $1,040,000 need. However, the same amount of buying power adjusted for 20 years of life, a 2 percent inflation rate and a 30 percent tax rate requires almost $1.7 million. That is a big error. So when you do this analysis, do it as a professional should … flawed! Step 2: Estimate the amount of the assets you have to fulfill your buying power needs. My Uncle Murray used to say, “Whether you are rich or poor … it is always good to have money!” When you retire and sell your business, it is the crux of the need. Very simply put, list all of the assets that you control. In the example below, we see there is more than $3 million in assets but only $1.6 million in net equity. The savings, business, business real estate and pension are all investible assets. Your home is not. Your home is an asset, but we do not assume it is investible because you must live somewhere. Some people plan to live in their home and then relocate, selling their home and buying a less expensive home in a retirement community. This is great, but the only contribution to the investible assets is the difference between the net sale of your house and the net purchase of the new home. You may have tax qualified retirement accounts. Whether these are IRAs or company-sponsored plans, the money in there is gross dollars since you would have to pay a tax on any distribution. The most important thing to know about valuing your business is that you cannot guess, nor should you ask a casket salesman, use hearsay or rules of thumb. purposes. The business real estate must be valued as a funeral home. Only someone who knows the business can determine the real value as an ongoing funeral building. Get a reliable value from a knowledgeable funeral home appraiser. Once we know the value of the business, we then must determine your basis. Basis is what you paid for the assets and is important as basis is recovered tax free. The difference between basis and sale price is the beginning of a discussion on the tax bill. Typically the tax is going to be a long-term capital gain. However, that is akin to saying all elements in the periodic table are the same. Asset sale versus stock sale. Did you convert from C Corp to S Corp at any time? Allocation between business and real estate. Amount applied to a covenant not to compete. Type of depreciation you used when you filed your business taxes. 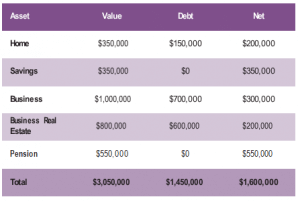 Through Step 2 your objective to be financially independent requires $1.7 million. Your investible assets (home has been eliminated) are $1,055,000. Right now, before we look at Social Security we have a shortfall of $645,000 ($1.7 million less $1,055,000). If you elect to work for several more years, there is more compound earnings potential for the savings and pension and perhaps additional contributions. The business and business real estate may change in value but will also have decreases in debt, which may increase the net and net after-tax results. We can assume the net after-tax may increase to $1.2 million at age 66 and by age 70 to about $1.4 million. Step 3: Determine the best method to secure your Social Security and other government benefits. $2,500/month for life, or wait until age 70 and receive $3,300/month for life. Which do you do? This depends in large part how much earned income you will be receiving. Earned income is not rent or covenant not to compete payments. It is for your labor. If you are going to have significant earnings, these will reduce Social Security benefits, until you turn 70 years old. This benefit is paid monthly but can be computed as a lump sum for the sake of estimating your financial independence objective. The net present value of the payments based upon a retirement at 62 and living for 20 years is an economic benefit of about $300,000, assuming 3.5 percent discount rate. This goes up to about $400,000 at age 66 and at age 70 it is about $525,000. Therefore, if you wanted to sell the business and walk away at age 62 or age 66, it will be tough without making a change to your budget or investing in a more risky fashion. What can you do? Maybe you look for a different type of buyer? Buyers fall into categories. Not the usual categories you might think. Those you want to work for and those you do not. Those willing to lease your real estate for a short period of time and those only wanting to buy it at the time of closing. Those that may cooperate with some better tax planning for the seller and those that are inflexible. If you go through this planning and find yourself being short of funds, think about the options. For example, you can work for the buyer. Maybe it is a partial year for a few years, but it could be enough to bridge the gap. Or, a short-term lease of the property could provide solid income for you in the early years of retirement so you don’t start to invade your assets. Perhaps tax savings could help bridge the gap. Maybe it is a bit of each of these. The more you know before exposing your business to the market, the better the outcome will be. Step 4: Invest your money conservatively. During your early years of life you could invest in margin accounts, but as you have less time to make up any loss you have to be more conservative. Several years away from retiring, you need to rein in the risk in your portfolio. Income is more important than growth. You can determine your risk at each phase of your life, but unless you have far more than you need to retire, you must reduce risk at retirement. In the world today we have more tools that allow a person to easily trade stocks and bonds. My father used to drive to his broker’s office to sell or buy a stock, and today we can do this on our smartphone during a baseball game. The ease of the transaction is not what a broker is paid for. The broker is paid for their advice. At some point you want to pay for that advice. Finding the best financial guru is tough. Interview them. Give them a chance to present to you a hypothetical $1 million portfolio. Watch the process they go through. Do they ask important questions to learn your level of experience and risk tolerance? How often will they review the results with you? Get them to audition! Another approach I like is to ask to see their portfolio. Many years ago when I was selling life insurance, I proposed a whole life policy to a young professional. He wanted to see my whole life insurance policy. You wouldn’t buy a Cadillac from a guy driving an 8-year-old Chevy! No broker is perfect. You want someone who is trying hard, educated, honest and communicates the good and bad to you. Check third-party sources. The Financial Industry Regulatory Authority is one source where you can plug in a broker’s name and learn a great deal of information about them. Make sure the data are consistent with your interview with them. Look at their licensure. Too many brokers have limited licenses so they have limited investment vehicles to offer. Business succession planning is not that simple. The process is complex. Choose a buyer based upon your interview with them. Have professional help. For me, the perfect scenario is when we have multiple offers that are very similar. The client can then interview these buyers. Talk about everything but the terms of the deal. Talk about how they will operate the funeral home. Ask what changes they perceive they will make. Talk to people that sold to them more than a year ago. We witness these discussions and if a buyer tells a lie, we let our client know. The key is to be financially independent after the sale. The business succession plan is just one step in the direction of the rest of your life. Don’t take that step alone. Have a qualified professional at your side. They will tell you what is coming around the bend.